By Stefan Rahmstorf via Scilogs The past 2000 years of climate change have now been reconstructed in more detail than ever before by the PAGES 2k project. The results reveal interesting regional differences between the different continents, but also important common trends. The global average of the new reconstruction looks like a twin of the original “hockey stick”, the first such reconstruction published fifteen years ago. Green dots show the 30-year average of the new PAGES 2k reconstruction. The red curve shows the global mean temperature, according HadCRUT4 data from 1850 onwards. In blue is the original hockey stick of Mann, Bradley and Hughes (1999 ) with its uncertainty range (light blue). Graph by Klaus Bitterman. 78 researchers from 24 countries, together with many other colleagues, worked for seven years in the PAGES 2k project on the new climate reconstruction. “2k” stands for the last 2000 years, while PAGES stands for the Past Global Changes program launched in 1991. Recently, their new study was published in Nature Geoscience. It is based on 511 climate archives from around the world, from sediments, ice cores, tree rings, corals, stalagmites, pollen or historical documents and measurements (Fig. 1). All data are freely available. The map gives an overview of the studied continental areas and the particular combination of the proxies used for each. 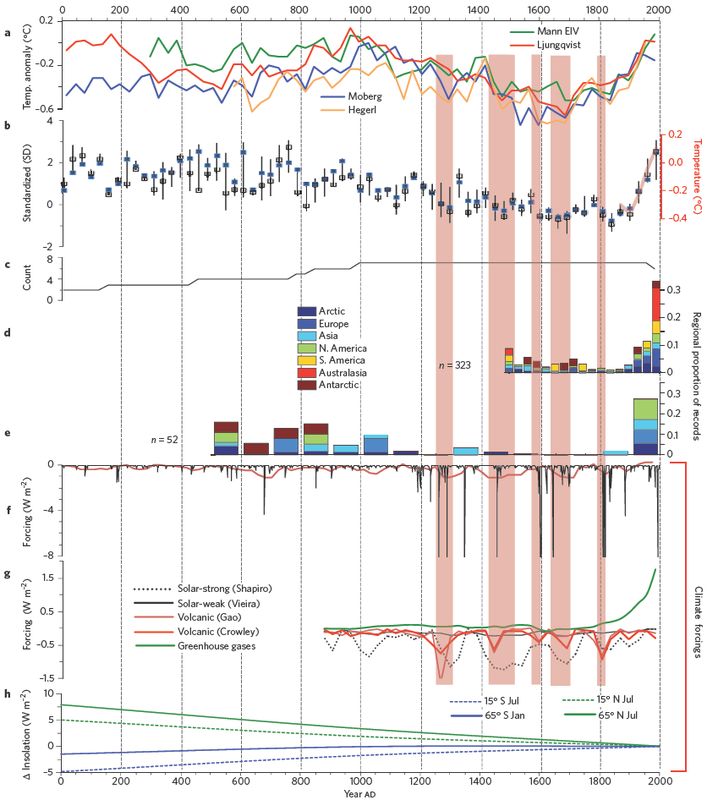 The climate history of the past one to two thousand years was reconstructed for seven continental regions in 30-year intervals ( below Figure). Temperature evolution of the individual continental regions (30-year average). Red means hot, blue is cold. The data show, as expected, significant regional differences. Such regional patterns are an important clue to the causes and mechanisms of climate change. Significant local variations in climate can occur through changes in the atmospheric or oceanic circulation patterns, with very little effect on global mean temperature, because heat is only distributed differently (a recent short-term example is the record cold March in parts of Europe while Greenland was extremely warm – nothing unusual happened in the global mean). Changes in global mean temperature, however, occur due to changes in radiative forcing (eg solar fluctuations). This forcing can be globally uniform (e.g. well-mixed greenhouse gases) or can have a regional pattern (for example, volcanic eruptions and orbital cycles). So in the individual continents one expects a response to the forcings, superimposed by internal fluctuations. There were no globally synchronous multi-decadal hot or cold intervals that define a worldwide Medieval Warm Period or Little Ice Age. But they identify some shorter intervals where extremely cold conditions coincide with major volcanic eruptions and / or solar minima (as already known from previous studies). The most coherent feature in nearly all of the regional temperature reconstructions is a long-term cooling trend, which ended late in the nineteenth century. (…) Recent warming reversed the long-term cooling; during the period ad 1971–2000, the area-weighted average reconstructed temperature was higher than any other time in nearly 1,400 years. The following Figure 3 therefore compares the area-weighted mean over the continents (b) with some previous northern hemisphere reconstructions (a) and the forcings (f, g, h). The basic pattern – a long-term slow cooling which in the late 19th Century turns into a rapid warming – has been known for 15 years and is often compared to a hockey stick: the long cooling trend is the handle, the modern warming the angled blade. Temperature evolution according to some previous studies (a) and from the new PAGES 2k reconstruction (b). The panels f, g and h show the radiative forcing, see text. Comparison with the forcings shows that this blade is due to the radiative forcing from the increasing amount of greenhouse gases in the atmosphere (green line in g). The solar and volcanic forcing can be reconstructed only with some uncertainty, therefore two variants are shown. For solar forcing, it is less the shape of the curve but mainly the amplitude which is controversial (a constant conversion factor) – the very high amplitude adopted by Shapiro (dotted line) is widely regarded as highly questionable (see, eg, Feulner and Judge et al ). But even with this extreme assumption, the solar forcing in the 20th Century cannot compete by far with the greenhouse gases, and it also does not match the temperature evolution. Interesting especially on long time scales of thousands of years is the orbital forcing (the well-known Milanković cycles; here is an online calculator for the radiative forcing). In the north, especially the summer insolation is important (green curve in panel h), because it is greatly amplified by the albedo feedback (ie, by changes in the ice and snow-covered area). This may explain part of the cooling trend in the Northern Hemisphere. In Antarctica the situation is different: in summer the ice-covered area is relatively constant at about the size of the Antarctic continent, because there is little sea ice, and the trend of solar radiation (blue curve in panel h) is relatively weak. Therefore the summer insolation change is much less important. But the annual average insolation in Antarctica (not shown in the PAGES graph) has declined strongly due to the orbital cycles over the past two millennia. This could be the explanation for the long-term cooling in Antarctica, which (unlike in the global average) has not yet been made up for by the modern anthropogenic warming. Climate models are computer programs that calculate climate evolution from such forcings, based on the equations of thermo-and hydrodynamics. In the last IPCC report 18 such model calculations for the last millennium by different research groups are listed, almost all of which reproduce the reconstructed climate history from proxy data reasonably well (see IPCC, Figs. 6.13 and 6.14 – the red-dashed outlier in 6.13 is the drift-affected model used by von Storch et al. in their failed attempt to discredit Mann et al.). The models also show that without the anthropogenic forcing there would have been no warming in the last 150 years. Green dots show the 30-year average of the new PAGES 2k reconstruction. Green dots show the 30-year average (area-weighted mean over the continents) of the new PAGES 2k reconstruction, as shown in Figure 3b. The red curve shows the global mean temperature, according HadCRUT4 data from 1850 onwards (also in Figure 3b, smoothed with a 30-year window). In blue is the original hockey stick of man, Bradley and Hughes (1999 ) with its uncertainty range (light blue). Graph by Klaus Bitterman. Stefan Rahmstorf is Co-Chair of Earth System Analysis, Potsdam Institute for Climate Impact Research. This article was originally published in German and translated was provided by the author.